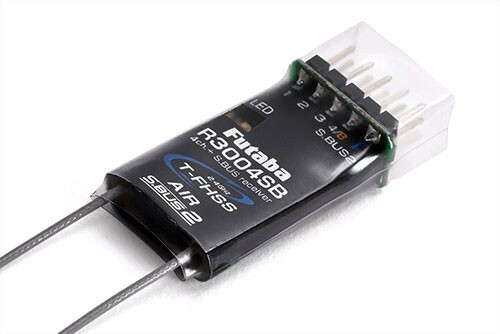 The Futaba R3004SB is a slim 4-channel receiver that is ideally suited to smaller models, as well as gliders/electric gliders that still require full range transmission. Futaba ditched bulky moulded cases and opted for lightweight heat shrink instead, this provides protection for almost any use but helps keep the weight down to just under 5 grams. The electronics are uncompromised, so the R3004SB has full telemetry features and full range transmission. It's slim and compact format makes it ideal for almost any application, whilst a pair of coaxial aerials provide solid stable reception with their length allowing them to be positioned at 90 degrees from each other, to give the maximum possible range. This receiver is not only ideal for DLG with it's small form factor, light weight, full range but also for large models since it is capable of S.Bus and S.Bus 2. It's a small and VERY powerful receiver.